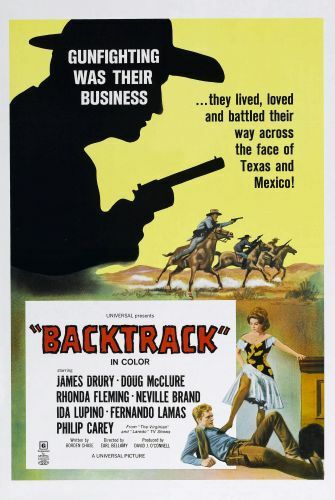 The fans of television shows The Virginian and Laredo will delight to the combined casts of the two popular series for Backtrack. Ramrod (James Drury) and Trampas (Doug McClure) are shown meeting for the first time as they go to work on the Shilo Ranch. Reese (Neville Brand) Chad (Peter Brown) and Riley (William Smith) are the Texas Rangers who meet Trampas when he travels to Mexico. Ramrod sends Trampas South of the border to pick up a prized bull. Trampas and the Rangers come across a railroad train where the only survivor of a brutal robbery is a baby. Captain Estrada (Fernando Lamas) and his spitfire mistress Madame Dolores (Ida Lupino) are the villains who give the good guys a bad time. Royal Dano, William Smith and Rhonda Fleming also appear. Chad tries to talk the evil Estrada into letting Trampas and the captured Rangers out of jail, promising further help for the scheming Mexican in this action-packed routine western saga.